Currently, the Kalamazoo County Health & Community Services Department operates at the Nazareth College. This facility has served as our home for over 20 years, and we are grateful to the Sisters of St. Joseph. The ability to easily navigate within our current building is difficult for customers and the community since we are spread out between two wings, multiple floors, and a ground level. To better serve our community, our new building will be centrally located within the City of Kalamazoo. We will have updated facilities and clinic exam rooms. Navigating throughout the new building will be easier as we will have one large waiting room for all programs & services and a centralized information desk right when you walk in. We're moving to better serve you! What dates are you moving and will you be closed for services during this time? Our last day at Nazareth College is Friday, July 27. We will be closed for all programs and services the following week, July 30 through August 3. We will re-open at our new building at 311 East Alcott Street on Monday, August 6 for all programs and services. Is the new building easy to get to? Yes! The new building is located in the heart of the City of Kalamazoo. You can access Alcott Street from Portage Street or South Burdick Street. The bus line, Metro, has pick-up/drop-off locations directly off of Alcott Street. Additionally, a bus stop is located in front of the new Health & Community Services Department. What programs and services will be available at the new building? You will be able to access all the same programs and services at our new Health & Community Services Building. Will there still be WIC services at the Family Health Center-Paterson St. and Portage Road locations? WIC services will still be offered at the Family Health Center-Paterson St. Office. 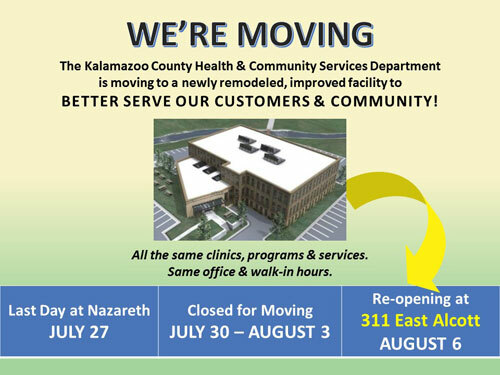 Due to the closeness of our new location at 311 East Alcott Street, the Portage Road WIC Office will close on July 31. Customers that traditionally go to the Portage Road WIC Office will be seen at the new location starting August 6. Since your new building is on a brownfield, are there any health concerns? Environmental testing near and at our facility has determined our new building is safe to occupy. Rehabilitation of an existing structure within a brownfield area is fairly common and can add value to our communities. Per the Michigan Department of Environmental Quality, the project area is part of the Allied/Portage Creek/Kalamazoo River Superfund site. Significant State and Federal resources have been spent to protect human health, safety and welfare, and the environment at and around the project site. Ongoing work in the area includes Alcott Street dam removal and floodplain and creek restoration. Will the Health & Community Services Department operating hours be different? No - the hours of operation will remain the same at the new building. Will your phone number change? No - our phone numbers will remain the same. Our main line phone number is 269-373-5200. Visit our website, www.kalcounty.com/hcs or "like us" on Facebook Page for frequent updates!